Send your deepest care and concern during times of sorrow with our precious blue and white sympathy arrangement. 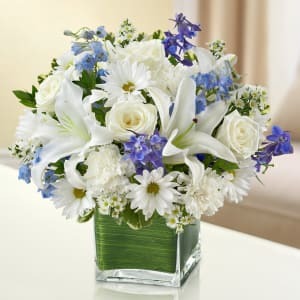 The freshest roses, delphinium, lilies, daisy poms and carnations are hand-designed in a stunning cube vase as a gesture of comfort and peace. • Elegant blue and white arrangement of roses, delphinium, lilies, daisy poms, carnations and monte casino, accented with variegated pittosporum and myrtle. 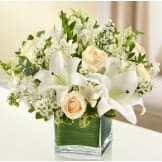 • Artistically designed by our florists in a classic clear glass cube vase lined with a Ti leaf ribbon; vase measures 5"H x 5"D.
Flowers will be received by a Roby Funeral Home's staff. Though I was not able to be there to see the flowers delivered, I was informed by a couple of family members that the flowers were absolutely "gorgeous"- their description. That is a great relief, when a person is counting on the arrangement to" represent" them at such a time. All of our flowers are designed and delivered by hand from a local florist in in Plattsmouth.